What a concept! Instead of cars polluting the air, now they can run on it! Say hello to the AirPod. This could be the greatest invention since hot pockets! A car that runs on compressed air is being unveiled this week at the Geneva Motor Show and creating an understandably major buzz. I started hearing about this technology more than a year ago. I told some of my friends about it and they asked me what I was drinking. A car running on air is not something the average person finds plausible, but now it’s no longer just a theory. It’s a reality and quite possibly our biggest chance to say adios to fossil fuels forever. You’ll still need to plug this car in to charge it, unless you live near an air fueling station. Once these vehicles become popular, I am sure that these stations will crop up faster than Starbucks locations. The gas companies must be scared to death of this car. At least hybrids require some gasoline. All these need is the air we breathe (and some electricity). The price is also highly attractive—only $7,500! French carmaker MDI is the first company to get these cars to market. Undoubtedly, this idea will evolve and gain momentum. Now that it’s possible, the sky’s the limit with the AirPod. Consumers have grown used to the idea of cars powered with alternative fuels, from hydrogen to electricity. But running a car on air? French firm MDI says it can be done, and used the Geneva Auto Show to display a bubble-shaped 3-wheeler it plans to start rolling out later this year. The AirPod car can travel up to 137 miles (220 kilometers) on a single 46-gallon (175-liter) tank of compressed air, producing zero emissions on the road, MDI spokesman Sebastien Braud said Wednesday. Drivers can recharge their air supply in eight hours by plugging the car into electricity outlets, or by going to special ‘air stations’ where the process takes only 2 minutes. The AirPod will be trialed by airlines Air France and KLM at their bases in Paris and Amsterdam, starting in May, said Braud. Another trial will begin in the southern French city of Nice in December. The car will take some getting used to, and not just because of its novel power supply. Steering is done with a joystick, and the only doors open to the front and back. The two passenger seats are rear-facing and can be replaced with a cargo space. Braud said the AirPod solves the problem of most electric-powered cars — heavy and costly batteries. This allows the car to be sold at a comparatively modest euro 6,000 ($7,500). MDI is already planning a second model. 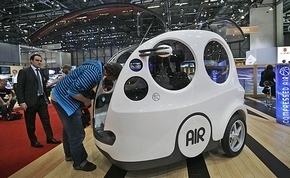 The 4-wheeler OneFlowAIR cabrio will also run on compressed air, but can burn conventional fuels to extend its range. Portions of this post compliments of Associated Press. Video of Nissan Esflow EV Sports Car Concept - The Sports Car of the Future?